Voir les vidéos de l’événement sur Akadem. International conference co-organized by the Middle East and Mediterranean Research Center (CERMOM) at the National Institute for Oriental Languages and Civilization in Paris (Inalco), the Paris Yiddish Center – Medem Library (Maison de la culture yiddish – Bibliothèque Medem) and the Department of Jewish Culture at Saint Petersburg State University. “Diaspora,” a term long associated with the Jewish historical experience, has undergone since the 1970s “an amazing inflation that peaked in the 1990s, by which time it was being applied to most of the world’s peoples” (Dufoix 2008). During the last few decades, “diaspora” has been subject to further reconceptualizations and theoretical redefinitions, resulting in what has been observed as a “diaspora” of the term itself (Brubaker 2005). Scholars began to explore the virtues of diaspora, stressing the “positive dimensions of transnational existence” (Werbner 2002) and the ability of diasporas to “mobilize a collective identity […] in solidarity with co-ethnic members in other countries” (Cohen 2008). The conceptual paradigm of center and periphery being increasingly contested (Clifford 1994 ; Levy 2005), “diaspora” has been recently redefined as “a synchronic cultural situation applicable to people who participate in a doubled cultural (and frequently linguistic) location, in which they share a culture with the place in which they dwell but also with another group of people who live elsewhere” (Boyarin 2015). First, both literatures emerged “in the diaspora” according to the most common understanding of the term in its Jewish context. However, considering “diaspora” as the dispersion of people across geographic areas, analogous to the fertile dispersion of seeds (according to its etymology, from the Greek dia-, “throughout”, and sperein, “to sow”), Hebrew and Yiddish literatures can be defined as diasporic for they have been germinating in various places and spread across a vast geographic area, establishing a series of consecutive and parallel literary centers in Europe, North and South America, Palestine, South Africa and Australia. Hebrew and Yiddish literatures produced in places such as Odessa, Vilnius, Warsaw or Berlin, were, on the one hand, anchored in those literary centers and their cultural and political contexts ; on the other hand, they were part of a non-territorial republic of letters and were addressed to readers scattered across the world. The diasporic “doubled cultural location” of these literatures can be attributed to their main sources of inspiration : Jewish traditional literature, written mostly in Hebrew and Aramaic, and European modern literatures. In addition, both literatures can be said to have been situated in a doubled cultural and linguistic location, both in relation to their non-Jewish surroundings and in relation to one another. The conference will conclude with a festive celebration of a new European Hebrew journal, Mikan Ve’eylakh (מכאן ואילך), which is dedicated to diasporic Hebrew (ed. Tal Hever-Chybowski). 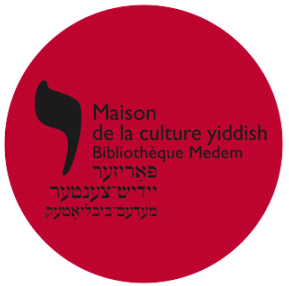 The closing event will take place at the Maison de la culture yiddish – Bibliothèque Medem (29, rue du Château-d’Eau 75010 Paris).